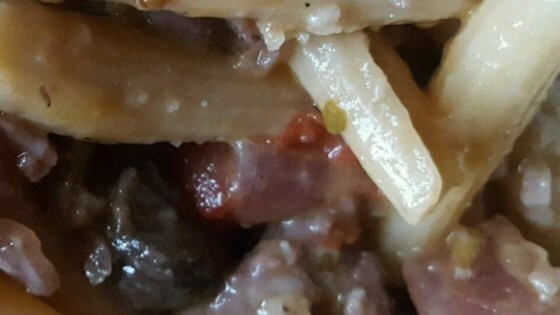 "This is a delicious pasta dish that uses a red wine reduction. Rich, hearty, and surprisingly easy to make. Use your favorite cheese to top." Fill a pot with water and bring to a boil; cook the sausages in the boiling water until no longer pink in the center, about 40 minutes. Cut the sausages into bite-sized pieces. Fill a large pot with lightly-salted water and bring to a boil. Stir the penne into the water and return to a boil. Cook, stirring occasionally, until the pasta has cooked through, but is still firm to the bite, about 11 minutes. Drain well. Combine the tomatoes, mushrooms, onion, garlic, wine, rosemary, oregano, thyme, salt, and pepper in a large skillet over medium heat; cook and stir until the liquid is reduced to about half its original volume, about 10 minutes. Add the sausage and the drained pasta to the mixture and continue cooking until the liquid is reduced to about one-quarter its original volume, 10 to 15 minutes more. Sprinkle the mozzarella cheese over the dish to serve. Very good!! Will make again. I always follow the exact recipe if I am going to review it. Great as is! wow...the spices are overwhelming. If I make this again, I'll cut all the spice amts. in 1/2, especially the salt and pepper. Way too much salt and pepper. I really liked the taste of this recipe! The only thing I regretted was adding the salt. Probably personal taste.